As bacteria get more resistant to antibiotics, researchers need to get more creative to clear them out. 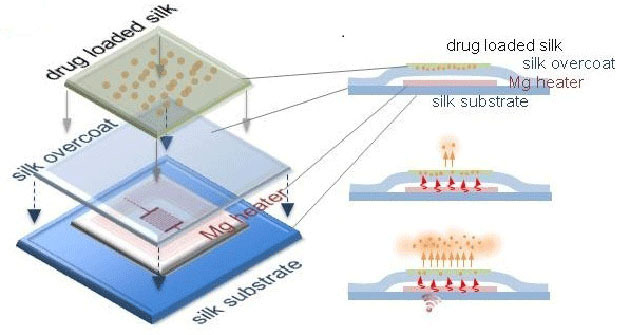 Researchers from the Tufts University and UIUC have definitely done that with a chip implant that can kill a localized staph infection with heat, then dissolve away. It consists of a silk substrate with a magnesium heating element that's activated by a wireless transmitter, raising the temperature enough to kill surrounding bacteria. The treatment time can be controlled for different applications, and the whole thing is reabsorbed into your body in a couple of weeks. It worked well clearing staph infections in mice, but the simplicity makes it promising for humans too. The researchers see the chip as a perfect way to check post-surgery infections by implanting it in a patient's body prior to suturing him up. A couple of weeks later, no more infection and no more chip.